For those of you who haven't known me for the last 10-12 years or more, allow me to let you in on something: before I was ever a photographer, and before I was serious about photography, I was a writer. I mean that in many of the same ways I now define myself as a photographer and what being a photographer means to me, I once felt about writing. I wrote constantly. I started with novels, when I was eleven--and continued to write them into my teens. I filled diary after diary with my words. I took up poetry and an online journal in high school, along with the occasional short story and of course, my X-Files fanfiction (serious). In college, I continued to right prolifically on the internet until 2004, when the cost of honesty became too high and I began to reevaluate things. I participated in and completed National Novel Writing Month in 2002, 2003 and 2006. I published my own zine in 2003 that at least one person has told me they've kept in a box of sentimental items all of these years. I wanted to be a journalist; that is, until I was an editor at my college paper and lost most of my love for the field. I wrote all the time. Every day. Until my hands were blistered and I could think of no more words. I don't know what happened, exactly, other than that over time, writing became harder and harder for me to do. Each year I felt more difficulty expressing my creativity & heart through my words. As my desire to write waned, my love for and dedication to photography grew, and I haven't looked back. I do write now, simple reviews for Examiner.com to go along with the concert photos I post, but it's almost always a struggle for me to put the words down, no matter how easy the article might be to construct. Psychology is a strange beast. 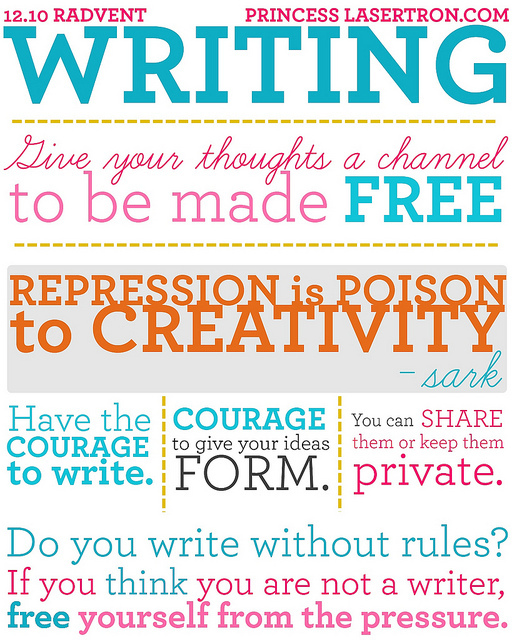 I do write without rules. I hate to follow rules after I've learned them, after all. Today I want to write about the amazing times I've had in the last 36 hours. It's one of those spates of wonderful experiences, one after another, that happen every so often and cause my heart and mind to almost explode with joy & disbelief that this is actually my life. It all began at work on Friday, when I was asked to photograph a class final project demonstration in the afternoon. I went in expecting to enjoy taking the photos, but not be engaged with the material; wrong. It was a robotics class, and the projects were all fascinating and really cool. My favorite was the robot (built on a hollowed out Roomba base!) that played pool. I felt really happy to have been invited to this, and left work feeling inspired & grateful (read: not always the way I leave work). That night, I attended a party for my friend's record label, which was celebrating its 5-year anniversary. I was getting paid to take photos at this event. It was kind of a roller coaster at times, and people weren't always friendly, but it ended well, I got to hang out with friends I hadn't seen in a long time, or in two cases, I'd known people online for literally years, and we got to meet & hang out in person for the first time. I stayed beyond the time I needed to because I was having a good time. That feels good. Really good. I arrived home to Scott telling me that "Santa Claus" was locked up in the downstairs bathroom (!). Long story short: I was finally allowed to open up the door ... and there stood ... a telescope! Orion SpaceProbe 130ST Equatorial Reflector Telescope -- in my house! 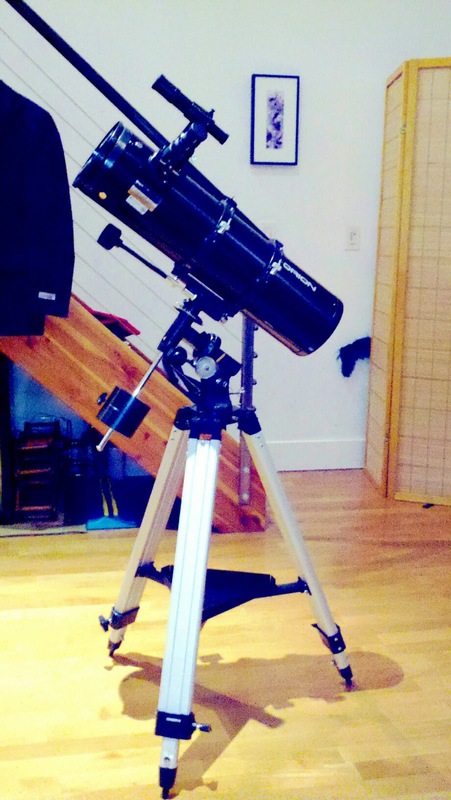 A telescope has been #1 on my wish list ever since I fell in love with astronomy and stargazing a few months ago. When Scott told me that he had something for me and that it was his "best ever" gift, I hoped so hard that it would be a telescope. Last night, when he presented her to me, was not an accident: we already had solid plans to stay up all night in order to watch the total lunar eclipse happening today from 4:45-7am. A telescope would take our plans to a whole other level. In spite of having an inkling of what was inside the locked bathroom, nothing could have prepared me for seeing Orieness (her name, my giving) for the first time. She is beautiful. She's huge (as big as I am!) and she's extremely sleek. She's a Newtonian reflecting telescope with two mirrors, and she travels well. And she's mine--well, ours, really. It's so much more fun to work as a team. The way last night played out for me was like the perfect, absolutely perfect, playing out of a fantasy. Scott spent a great deal of time calibrating the telescope before we bundled up (as it turned out, not nearly enough), packed ourselves and the telescope into the car, and drove through the mostly-deserted streets of San Francisco at 5am, headed for better viewing on the western side of the city. We stopped at Marina Green, a desolate field next to a harbor and across busy Bay Street from rows of rich-people houses. We could see both the Golden Gate and Alcatraz in the distance as we walked to the dark middle part of the field and set up the telescope. It's really tough for me to recount just how magical this experience was. There we were, in the pre-dawn darkness, alone save for the waning moon, our telescope & a few insane people jogging by or walking their dogs. It was very cold out, I'd say in the low 40s with a wind, and we weren't sheltered from it or prepared to spend an hour out in it at all. After we fixed the telescope on the moon, and Scott taught me how to refocus it as it moved, the true beauty of the lunar eclipse and seeing it together began to sink in. We would trade off looking in the telescope and discuss physics & astronomy; later, as the cold really started to get to me, I'd hand the 'scope off to Scott and jog vigorous circles around him to keep warm! It seemed ridiculous, and GOD, that's what it was, ridiculous, perfect, beautiful life.